I've never been so excited about any of my previous post, but today I have something special to share with you girls and this is the jewelry that I received from the Viviclothes. VIVI Clothes is a company focused on fashion and women in the Netherlands. They deal in high quality clothing from Japan, HongKong and Korea. VIVI Clothes is known for unique clothing, shoes, gadgets, jewelry makeup, menswear and fashion accessories. The special thing about the site is they own a special range for the smaller women accessories and has the unique sizes such as: xxs, xs, s and m size also special shoe sizes we offer such as: size 30, to,47. The package came in a week with the beautiful chain and a sparkling small bow ear-rings along with red figure ring, but unfortunately ring came damaged so I didn't post it here also the jewelry they sent was too small for me and wasn't very noticeable. I was very disappointed then suddenly my niece came in a room and started kissing me and I knew that she wanted me to give that necklace to her. She is only one and half years old, but love to wear makeup and jewelry so i gave that necklace to her. I like the chain, this is no doubt very beautiful, cute and trendy and designed with care & love. Made of sterling silver and polished by hand with superior shine. 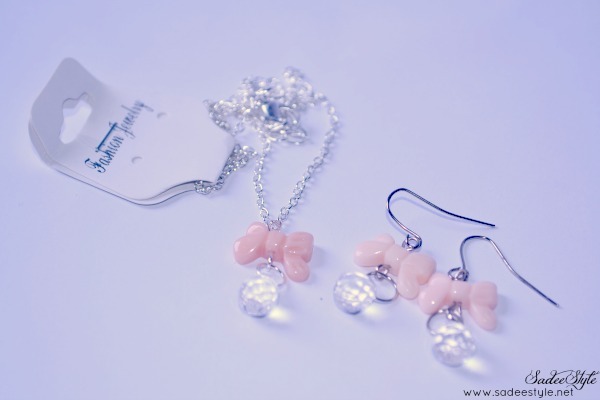 Beautiful chain with Bow tie-shaped figure look really pretty and feminine, ideal for baby girls, Although the material subtle, but firm still not very durable suitable for a fancy party. However, it wasn't very noticeable on me, but my niece love it and wearing it and she looks really happy. You can visit Viviclothes for more variety and designs. Can be a best gift for baby girls. Design is cute and chain is resistant and stylish. Material is subtle and not very durable. Size is quite small not very noticeable. 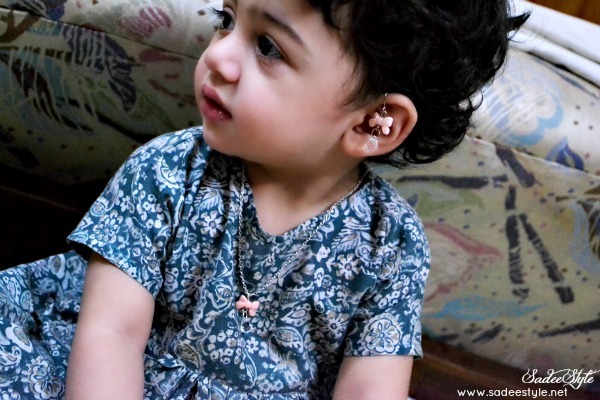 Cutest little kid ever ^_^ And yeah, pretty cool earrings! Awe they are soo cute! Your niece is Adorable <3 ...Lovelyyy post!